Preprogrammed keyboard patches for over 40 shows. In a similar way to the Really Useful Group providing programming for Jesus Christ Superstar (see Keyboard & Equipment Hire), Realtime Music Solutions provides authentic sounds for over 40 popular shows (and counting). Every sound in the keyboard parts is laid out in order, balanced and sounds superb making life so much easier! For full details on the benefits and the up to date catalogue, please visit www.rms.biz/products/keyboards. You need three or four components to make it all work – the RMS software for the particular show, a laptop/computer to play the sounds and run the software, a MIDI controller/keyboard (or several, depending on the show) and ideally a professional audio interface as most laptop/computer soundcards are low quality. We can supply the whole package for you or you can mix and match between your own equipment (keyboards for example) and ours. If you get the whole package from us it will have been tested together; obviously if you use your own equipment we can’t really help with obscure problems. The RMS website contains a couple of video demonstrations of the advantages of using their software - Video 1, Video 2. Please use the menu on the left for further information on the components. 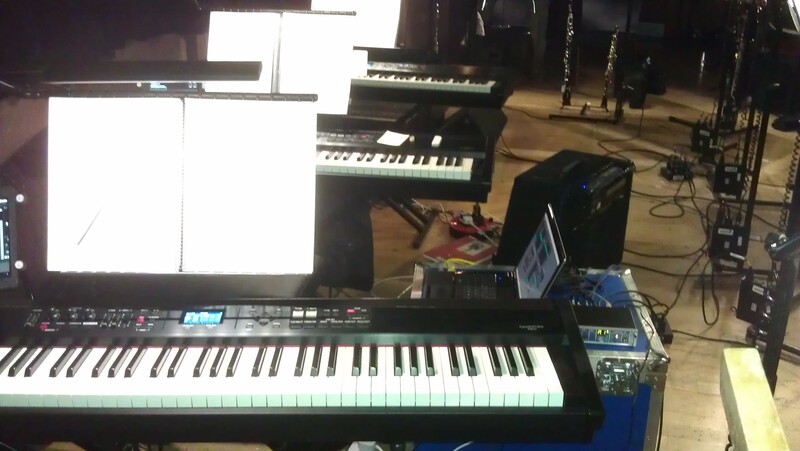 This is an example setup for a three-keyboard show using MIDI cables, laid out on the floor to make it clearer. 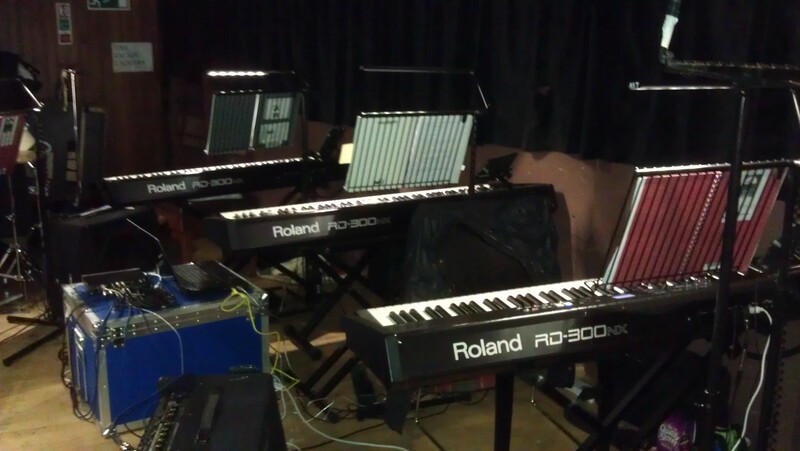 This shows a mixture of Roland, Yamaha and Korg keyboards (it makes no difference), one of our laptops and professional RME audio interfaces (Babyface and Fireface). The Korg is plugged via its MIDI OUT socket into the blue Babyface and the other two keyboards into the Fireface. The blue cables at the top are the balanced stereo outs - all keyboards here are getting mixed into one output. You could if you like have separate outputs for the three keyboards (all come out of the same Fireface, i.e. six cables). As a guide to cost, a three-keyboard show would cost you from £335 per week to hire, plus carriage. Additionally you need the RMS software license but this is charged as a set fee, not on a weekly rate. You can have the same setup with only one interface (either of them) by using USB cables (MIDI-over-USB) to connect either the Yamaha or Roland keyboards directly into the laptop, bypassing the need to use a MIDI interface. The Trinity does not have this facility though so has to use the MIDI cable method.